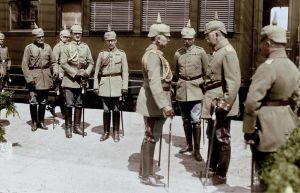 Emperor Wilhelm II inspects in Mitau (now Jelgava in Latvia), together with General von Hutier prepared troops on the station during his visit to the 8. Army on July 30, 1917. Breathtaking. History in color really does change the perspective, almost like it happened only yesterday. Wonderful work. The steel helmet was introduced to the German army in 1916. The units shown are ordinary units. Everybody wears "feldgrau" - field grey why the coloring sould have more grey tone instead of olive. Behind the Kaiser and GEN v. Hutier Leibtrompeter des Kaisers (trumpeter of the Kaiser) in his anachronistical peace time uniform. great image. those infamtry with the Stahlhelm must be stosstruppen. Sehr gut! Got Mit Uns! When I first saw this I really wondered if even one of those soldiers would be older than 18. They all looked so young on the first glance. I can´t help but be amazed how you colour these pictures. All the details in your pictures are impressive. I think they are 18-25 years old. and that is Von Huntier... the father of the Stormtroopers? Impressive pic, not a lot of clean looking WWI images out there. Kudos. yes,I think is very sharp looking photo.